The University has committed to spend 85 million dollars to fund the strategic plan, in addition to 40 million dollars annually allocated to the staff involved with its development and implementation. 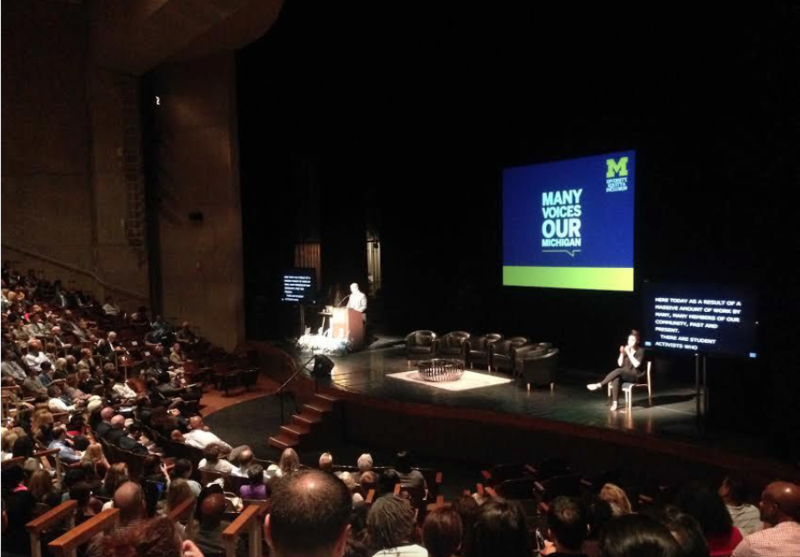 On October 6, the University of Michigan revealed its five-year strategic plan to enhance Diversity, Equity and Inclusion on campus. The plan, as laid out by Vice Provost and newly appointed Chief Diversity Officer, Rob Sellers, aims to: 1. Develop an equitable and inclusive campus climate, 2. Foster a more diverse community, and 3. Provide innovative and inclusive scholarship and teaching. The Diversity, Equity and Inclusion plan is comprised of a general U-M strategic plan and 49 individual unit-plans, which include programs established by all nineteen colleges. The University’s strategic plan is intended to support these individual unit plans by accomplishing its three overarching goals. The University has committed to spend 85 million dollars to fund the strategic plan, in addition to 40 million dollars annually allocated to the staff involved with its development and implementation. This money will be used to accomplish specific campus-wide actions, such as “cultural awareness” training for students and faculty, a campus climate survey, strengthened support for students in crisis or bias incidents, implementation of an “intercultural development training pilot” program for students, as well as a 10 million dollar establishment of a centrally located Trotter Multicultural Center. President Schlissel emphasized the University’s commitment to the ideals of Diversity, Equity and Inclusion at the strategic plan’s introduction on Thursday. This statement echoes the sentiments expressed by the Office of the President over recent months, and more recently President Schlissel’s response to racist fliers posted in Mason and Haven Hall. These are commendable words of support, but in light of President Schlissel’s silence toward SAFE’s anti-Israel demonstration on Rosh Hashanah, these words now ring hollow. Students Allied for Freedom and Equality—a campus organization committed to promoting a “…just resolution of the Palestinian-Israeli conflict”—erected a mock apartheid wall on the Diag, while imitating Israeli Defense Force checkpoint guards by yelling at bystanders. Many students in the Jewish and pro-Israel communities on campus felt demeaned and ostracized by this demonstration, as the world’s only Jewish state was denigrated and vilified on the high holy day of Rosh Hashanah. Students that spent Rosh Hashanah in religious services were unable to engage in thoughtful discourse with the SAFE protestors, as any opportunity for worthwhile conversation was diminished. Some students on campus responded to these events by authoring a petition to President Schlissel, expressing their sense of pain and exclusion by this demonstration. In the petition, the students called upon President Schlissel to issue a message of support to the Jewish and pro-Israel communities on campus, akin to the message he issued to the student body in response to the racist fliers. Despite these voices of concern by the Jewish and pro-Israel communities on campus, President Schlissel has made no statement on the impact of the demonstration on students on campus. It seems entirely hypocritical for the President to posture messages of inclusivity and equitable treatment on campus amidst the introduction of the University’s Diversity, Equity and Inclusion plan, while simultaneously ignoring the considerations of students that feel directly antagonized by University-approved actions. Although I draw no parallel in the severity of the actions between posting racist fliers and the aforementioned political protest, it still behooves the President to issue a similar message of support to a community on campus that feels demeaned and alienated, when the modus operandi of the University administration is to promote a welcome and inclusive campus. President Schlissel stated at the Diversity, Equity, and Inclusion strategic plan launch that “…the future of our great university will be determined by how well we embrace the values of diversity, equity and inclusion.” If the future of our university is determined by the success of this plan, then it will be crucial for the President to make difficult decisions in light of prevailing situations. Although clearly necessary, it is far easier to make statements against racist and prejudiced fliers and posters than it is to address situations with complex political dynamics. It will be in these situations that President Schlissel defines his vision of a diverse, equitable, and inclusive University of Michigan.